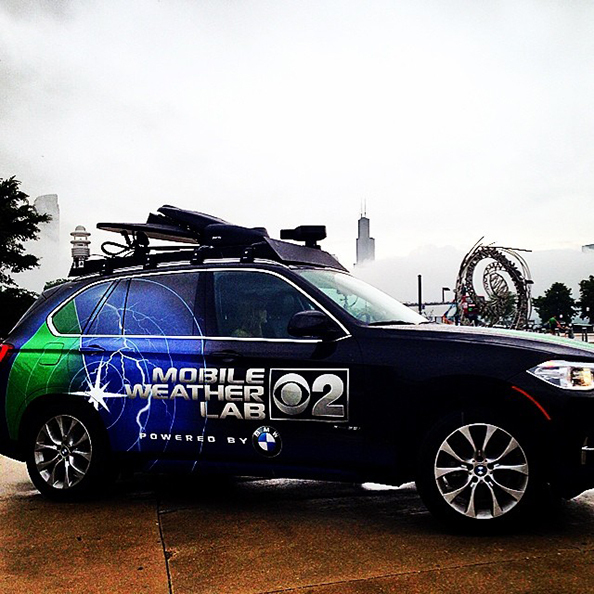 WBBM-TV, the CBS O&O in Chicago, unveiled its new Mobile Weather Lab on Thursday morning’s newscast. The modified BMW is a black vehicle with a blue, green and silver printed wrapper that seems to be closer to the CBS O&O Pyburn Films graphics package than the new look that debuted last fall. The vehicle, which took over 100 hours to retrofit, is equipped with a Columbia Pulsar 600 ultrasonic weather station can pinpoint inclement weather at precise locations; and monitor temperature, wind speed and direction, dew point, barometric pressure and other conditions, according to the station. In addition, a wireless joystick inside the vehicle controls the exterior-mounted robotic HD camera, which can rotate a full 360 degrees. Two additional GoPro cameras, one on the dashboard and another on the side, can be mixed using a touchscreen panel and broadcast live back to the station using satellite technology. WBBM-TV, as well as the market’s NBC affiliate WMAQ-TV and ABC affiliate WLS-TV already use station vehicles to deliver live video from the road during weather and traffic stores. WBBM-TV brands these shots as “Mobile 2,” but also often uses that name for general live shots.